Learn how to play Elvis Presley’s classic, Don’t Be Cruel, on your 3-string cigar box guitar with the free tablature in this post. Written in 1956 by Otis Blackwell and recorded by Elvis in that same year at RCA studios in New York City, Don’t Be Cruel turned into a smash hit for “The King”. Although an RCA recording executive is credited with producing the song, studio recordings allegedly tell that Elvis himself reworked the arrangement on piano and insisted on 28 takes before he was satisfied with the recording. Now, you don’t have to worry about perfectly playing this song – rather, just learning it on your 3-string cigar box guitar. 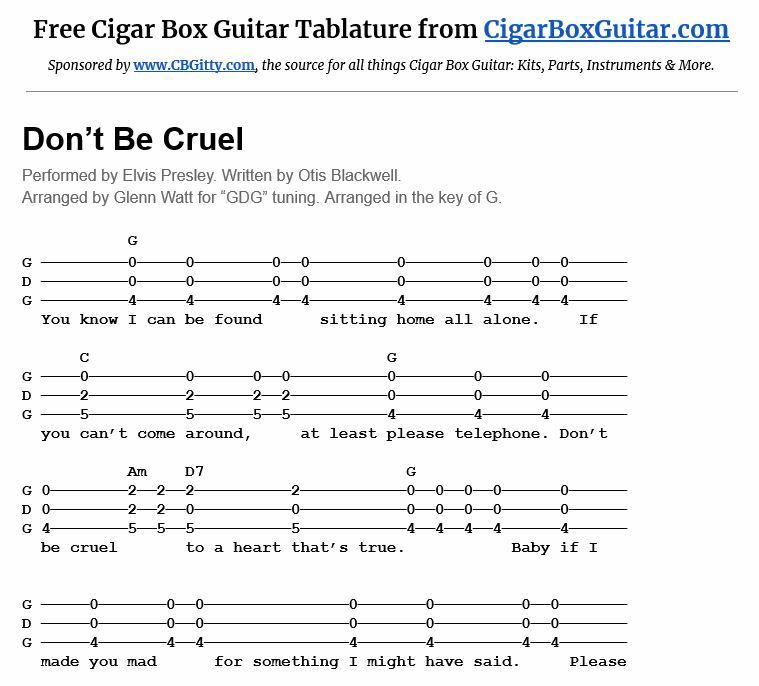 To do that, all you have to do is click on the image below to download the free pdf tablature for Don’t Be Cruel. For your convenience, print out the tab and keep it with you for whenever you have time to practice, or when you go to a jam session. If you need help reading tablature, check out this short video tutorial.